The Switchboard from Venomsnow could be just the tonic to revitalize the winter sports market by opening up a whole new segment, right beside skiing as well as the humble snowboard. According to Marcel Jonker, the double-hinged Switchboard could be seen as a natural evolution of the snowboard, but until that is proven, it could potentially end up as the kick-scooter of the ski slopes. This product from Holland is certainly an interesting one, and we’ll read more about it after the jump. The Venomsnow Switchboard will feature a couple of short woodcore boards that are joined end-to-end on a double hinge, featuring lightweight footstraps on top, twin skates at the bottom of the rear board, and an aluminum steering bar on a pogo stick-like suspension unit which is mounted on the front board. 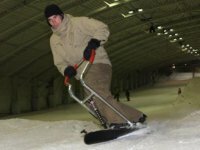 The main idea behind the double hinge action is to enable Switchboarders to bend the board up and down, as well as left or right in the middle to carve tight curves whilst following bumpy terrain. The inclusion of the steering bar is a great idea since it allows riders to initiate turns and haul the front end up in jumps. As for the suspension unit, I haven’t exactly have it all figured out just yet, but chances are it will help minimize the impact on your knees whenever you land a jump. Another good point about the Switchboard would be doing away with the need for special boots whenever you take this out for a ride. It features a pair of loose straps front and back that enable your feet to slip in easily, even if you’re wearing nothing but a pair of ordinary sneakers. I wouldn’t recommend that when the mercury has dropped tremendously though. The back footstrap is mounted to a pivoting turntable, allowing your foot to twist to different angles for maximum comfort and handling. Just like a skateboard, the Switchboard allows you to take your back foot off to kick yourself along as you’re going to gain more momentum. Whenever you need to store the Switchboard, just fold down the hinged setup into a compact, portable size.